Are Side-by-Sides Worth The Money? Massey Ferguson brings you high horsepower performance in a frame package that incorporates agility, versatility and a price closer to a mid-range tractor. Tillage, planting, harvesting, lugging, baling, loader work...the 7700 series tractors can do it all. You'll get high efficiency with the wide variety of implements you may need, minimizing your operating costs and maximizing your time. Features of the Massey Ferguson 7700 series include more uptime and greater performance. Unmatched versatility and affordable cost of ownership. Less maintenance and ease of operation. Come in today and talk to one of our tractor experts to learn more about the Massey Ferguson series machines. We're proud to carry the Massey Ferguson 6700S series tractors. Heavy duty components and a new design give you long-lasting durability and reliability. We think your equipment should work as hard as you do...and the 6700S series tractors come pre-fit to pair with the MF900 Series loader. Chose from three transmissions: whether you're doing a lot of heavy loading, medium-sized tillage work, pulling a moco or baling hay, we can put you in the machine with the transmission to do the job every time. Small farms, dairy farms, hay farms... the 6700S will pull for you all year long, with a comfortable cab and reliable power and good maneuverability. Stop in today and let our experienced staff help you get into the cab of a 6700S and back out to your successful operation. This is the tractor you're looking for when you need a heavy-duty, purpose-built machine with immense lift capacity and the power you need to pull larger, heavier implements. Tested around the world --from humid Southeast Asian rice paddies to bitter cold Northern Europe and oppressively hot Africa -- these tractors have done it all. Fewer parts and a less complex design have proven to offer better fuel efficiency and easier maintenance. The 80-100 horsepower engines are specifically configured for North America, and deliver maximum torque at low engine speeds. Clean exhaust and miserly fuel consumption make for an unmatched operator experience and comfortable cost of operation. With four valves per cylinder, the engine runs cool and smooth, and helps keep service costs down, too. An easy-to-operate transmission provides multiple speed options under any circumstance. The 4700 series lets you adjust how the trans engages when starting from a full stop, enables you to simply press a button to shift gears when you're turning...and more. Come in and talk to one of our knowledgeable staff, who can demonstrate all the bells and whistles that make this workhorse as gentle as a kitten for the operator! A new 3-cylinder AGCO POWER™ engine brings more power and greater efficiency to the 4600 Series utility tractors from Massey Ferguson. Loader and hay work has never been easier! These utility tractors are affordable, powerful, versatile and comfortable. They feature a new hydraulic power shuttle transmission that lets you go from forward to reverse and back again without clutching. And that means that doing loader work is going to be less stressful and more productive, and easier on both you and the machine. Each model is also Tier 4i compliant: Using electronic engine management, the 3-cylinder engine is both powerful and fuel efficient, without the need for regenerating particulate filters. Come in today to see the 4610MLMFD cab tractor and let our staff give you the full specs and financing information for this powerful utility tractor. Today, a new generation of rural lifestyle customers --hobby farmers, farm-to-table producers, small businesses and large acreage landowners who maintain their land--need a new, smaller tractor with the power to get the job done. For them, we proudly offer the 2700E Series Massey Ferguson tractor. These hardworking, tough little machines combine the practicality of a compact tractor with the functionality of a utility model. easy-to-operate tractors that combine modern-day innovation, value and comfort, with the quality you've come to expect from all Massey Ferguson products. Come in today to learn more about this hardworking, dependable little tractor. Be sure to ask about financing. With its longer wheelbase and adjustable wheels for wider stance, the 2700E Series is as stable as can be. It's sturdy, with an excellent power-to-weight ratio and powerful 2,425-pound lift capacity gets the job done. And the maintenance-free Tier 4-compliant emissions system has no diesel particulate filter (DPF) to worry about changing. You can choose a category I or category II hitch to fit the way you work, and optional L135E Loader and CB85 Backhoe available. Telescopic lower links make attaching implements a breeze. These are comfortable tractors, with excellent operator visibility and convenient ground-level fuel fill with more fuel capacity (14 gal.) than competitive models. The 1700 series premium compact is, simply, best in class. Advanced engineering and performance options similar to bigger tractors meld with the simplicity and fuel efficiency of a compact. Ideal for general maintenance on small mixed or specialty farms, horse farms, hunting properties or for landscaping and construction work. The turbocharged and intercooled 3-4 cylinder diesel engines, ranging from 36.2 to 59 gross engine horsepower, meet Tier 4 Final clean air emissions requirements. You can choose between gear or hydrostatic transmission. Features also include a wet clutch for durability and a modulation button for slow, smooth start-up to prevent shock load damage. Ready for the best compact tractor in the market? Come in and see us today. Easy to operate, easy to afford. 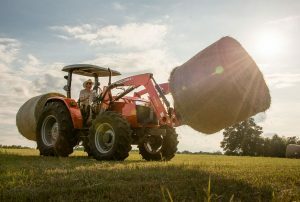 With bigger tractor features in just the right size, these tough little workhorses can handle mowing, loading, backhoe work, snowblowing and more. The GC1700 has the largest engine in its class, which means higher reserve torque and more efficient use of horsepower; it come with all-cast-iron construction, not aluminum heads. And the operator station is comfortable, with major controls and functional pedals in familiar, intuitive location, reminiscent of the cab of a lawn tractor. But there's where the difference lies: with the GC 1700 you can mow with the professional quality mowing deck, do your loading work with dual-bucket cylinders and efficient hydraulic pumps, or add the matched CB65 backhoe and extend your work capabilities. If you're ready to get to know the GC1700, come in today and let our expert tractor sales staff show you around one.